SUMMARY: Em and Finn must go back in time four years in an effort to prevent the totalitarian regime from taking control in the future. REVIEW: This was one of those books I read because I kept seeing glowing reviews, even though I didn't understand the summary at all. If the summary sounds confusing to you, know that the book itself isn't (at least, it's not too confusing). Now that I have finished All Our Yesterdays, the summary makes complete sense to me. All Our Yesterdays is absolutely fabulous, one of my favorites of 2013. I haven't had the best history with time travel books, so All Our Yesterdays blows the others away. Terrill pays attention to details and unravels the plot slowly so the reader has to figure out what is going on. I love the mystery of this book, the way I am given just enough information to make some guesses but not so much information that it's predictable. It's like putting together a puzzle without the picture on the box. You don't know what is going on, but as pieces fall together, you start to see the complete picture. This is one of those books where I wait a day or two to write the review because I need some processing time. I finished it two days ago, and I just keep thinking about it over and over. AOY reminds me of the 2004 movie The Butterfly Effect because the premise is so similar. Both feature protagonists who revisit the past in order to right some horrible future wrong. Both really stuck with me and made me think about how much life can change based on seemingly inconsequential events. I absolutely adored the ending. At one point, I was thinking this might end up being a four-star book due to some slightly slower pacing through the middle and the fact that I didn't read as compulsively as I do with my five-star books. But then I read that ending, and I can't in good conscience give this anything less than five stars. Perfect and complete and hopeful. Love, love, love! The only thing I didn't love about this book is that it is going to have a sequel. 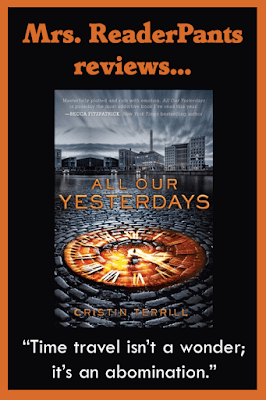 All Our Yesterdays is a perfect stand-alone novel; I don't know what Terrill could possibly add that will improve the story or make me anticipate reading it. I'm not saying I won't read the sequel, but I'll be taking my time getting to it. I hope the sequel doesn't ruin this first installment, which for me, is perfect just the way it is. THE BOTTOM LINE: Time travel never looked so good. 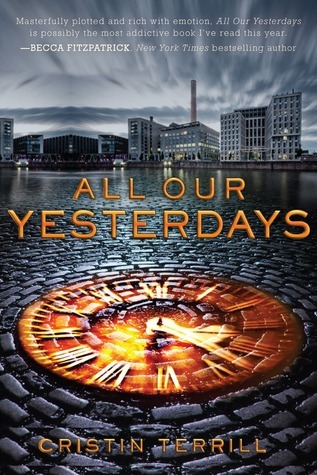 Excellent writing, character development, and an engaging plot make All Our Yesterdays among my top picks for 2013. STATUS IN MY LIBRARY: On order. It does have some mature content, so I will recommend this one mostly with my 7th and 8th graders. Oh my god! I loved.that movie!!! I'm definitely reading this asap.